The Mulberry Bush Montessori Balfron 10k, recently voted the number one 10K in Scotland by readers of Runner’s World, is to be featured on BBC 2 Scotland’s new sports series – Sport Nation. The presenters Rhona McLeod and John Beattie, who have both completed the race, are returning on Sunday 17th April with a film crew. Rhona commented, ” The Balfron 10k is one of the most beautiful courses in the country – it’s a fabulous 10k and I’m looking forward to capturing some of the highlights”. 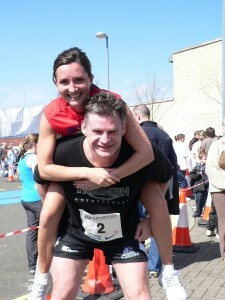 So now’s the time to enter on line at www.balfron10k.org.uk and perhaps feature in the programme. A “Virtual Run” of the race is available on the website. Savour the magnificent views of the Campsies or check out that wee hill at 7km, log on to the website now. Fantastic prizes generously donated by Taggarts Motor Group Glasgow, Esporta, Milngavie and Glengoyne Distillery. Add in some quality spot prizes donated by both Polaroid and The Running Company, Bridge of Allan plus money off vouchers from a few of our favourite sponsors and enough snacks to feed an army. T-shirt, medal and goody bag for all finishers. Well we like to spoil you! Look forward to seeing you on Sunday 17th April at 11am at Balfron Campus.